The Spring View Select 6834CT Mobile Home Floor Plan offers 1,860 square feet of living space. It is 32' wide and 62' long. A very spacious house with a formal living room and a separate family room that adjoins the dining room. 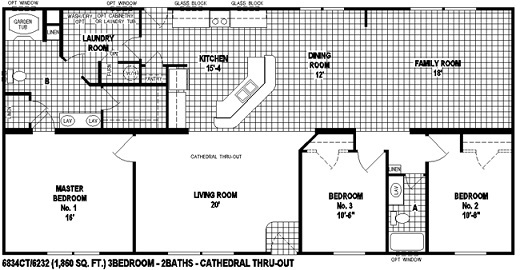 This is a great floorplan for entertaining guests or just being together as a family. The bar is an actual sit down bar for those informal dining moments. This floor plan features a larger bath adjacent to the laundry room for ease of access and the laundry room is just off of the back door so they can come in with out tracking.